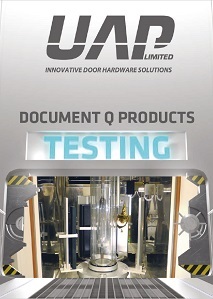 The UAP 12 inch COLOURED DOORMASTER letterplate combines security with a modern and contemporary look. Each letterplate consists of a colour matched frame for a stylish look. The matte finished frame conceals any scratches that may have appeared during installation. COLOURED DOORMASTER still retains the best elements of the ever popular Framemaster® range, making it the ideal choice for a product which is both stylish and incorporates anti-vandal features. The range consists of an enclosed, rounded flap, set against a shallower frame, giving a less intrusive but sleek feel to the door frame. Each letterplate has a central sleeve, meaning that it can fit in waste (mid) rails. The cavity dimensions also mean that you do not need to change CNC machines routing dimensions in order change over to this modern letterbox. The cavity hole dimension to drill into your doors in order to fit the 12 inch COLOURED DOORMASTER letterplate is 258mm x 42mm. 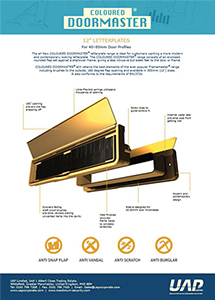 The COLOURED DOORMASTER letterplate incorporates many features that not only create better draught proofing and help direct letters through the cavity, but also incorporate the trademarked anti-vandal feature to defend against unwanted items being pushed through the letterplate. 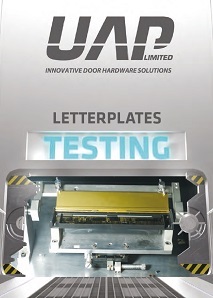 Another great feature of all UAP letterplates is that each letterplate flap can open to 180 degrees, meaning that it should not snap, and making letterplate flaps snapping off a thing of the past. 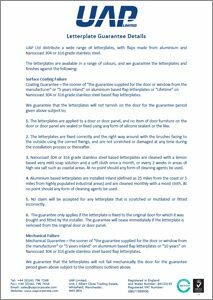 Many letterplates in the industry only open to 90 degrees, so when too much force is applied when lifting the flap up, it causes them to snap off. The ultra-flexible springs means that they can withstand thousands of openings without breaking, making them last even longer. Also, an internal water seal also prevents water getting into the door or panel, which stops letters getting wet as they are posted through, and also helps to prevent the flaps from pitting or rusting.